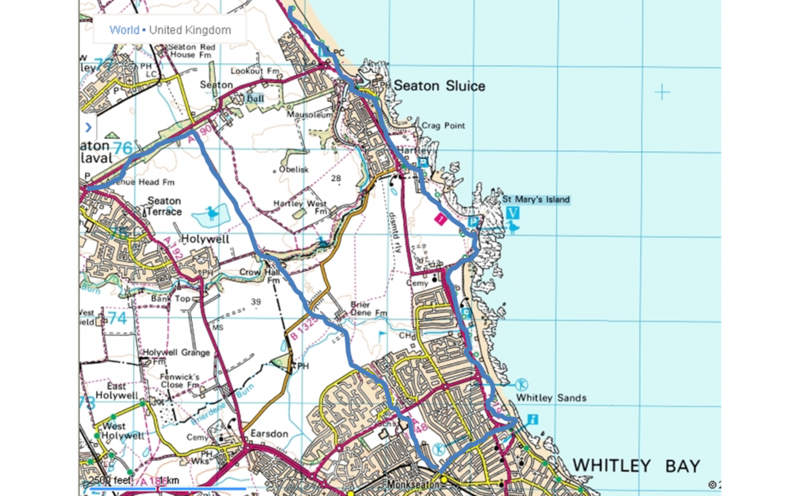 Whitley Bay Route - Suscram. 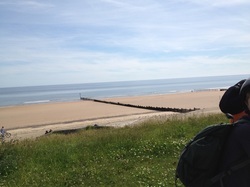 This bike ride gives you a good run along the coast and you will see some excellent views, also the final destination of the ride is Whitley bay links there is variety of different food take away / restaurants. It’s a great ride for all the family! Leave Cramlington learning village and turn right at the cycle track, follow the cycle track through the under pass and take the left fork, carry on up the path until reaching the children’s park on your left. Turn right at the end of the cycle path, follow the right hand path to the car park on the right and head towards the War memorial. Cross the zebra crossing past the right hand side of the Blagdon arms, follow the cycle track path past Parkside School and under the underpass. Follow that track passing Burnside Primary School on the right. At the bottom of the hill take the path to the right following the blue cycle signs for Blyth South Beach. At the end of the park on the right you need to turn right and keep following that path all the way until you get to the road at Bog Houses. Turn left towards the mini roundabout and then right at the roundabout following the road up the hill to the next junction. You will see the Three Horse Shoes Pub in front of you so be careful getting across the road towards the pub. Follow the lane to the left of the pub and then you will reach the bridge over the spine road. Ride through the farm until the end and then turn right down the gravel track until reaching a gravel junction, then turn left. Carry on until getting to the corner of the golf course, the first set of conifer trees is on your right. Go into the trees until reaching the exit, cross the road then turn left all the way along to a roundabout in Newsham, cross the roundabout and ride all the way down the road to Blyth beach. Ride all the way along the non-traffic cycle track along the coast until reaching Seaton Sluice. Look out for the King’s Arms Pub on the left and head towards that. Continuing south, towards St Mary’s Lighthouse follow the road until you get the roundabout at the top of the hill. Turn left down the hill towards the sea. There is a car park at the bottom and you have to take a sharp right so be careful. You are now back on Route 1 so follow the coast path all the way along. 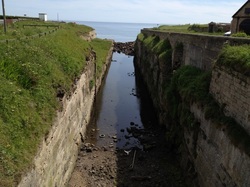 You could take a detour to the Lighthouse or perhaps visit the pitch and putt course on your way to Whitley Bay Links. 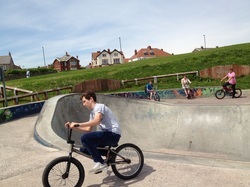 Riding along the promenade you need to turn right at the lights next to the Spanish City/ amusements and head up Marine Avenue towards Monkseaton Metro station. Just before the bridge turn into the right (Hartley Ave) and in between the bushes there is the access point to the Avenue Branch Line Waggonway. 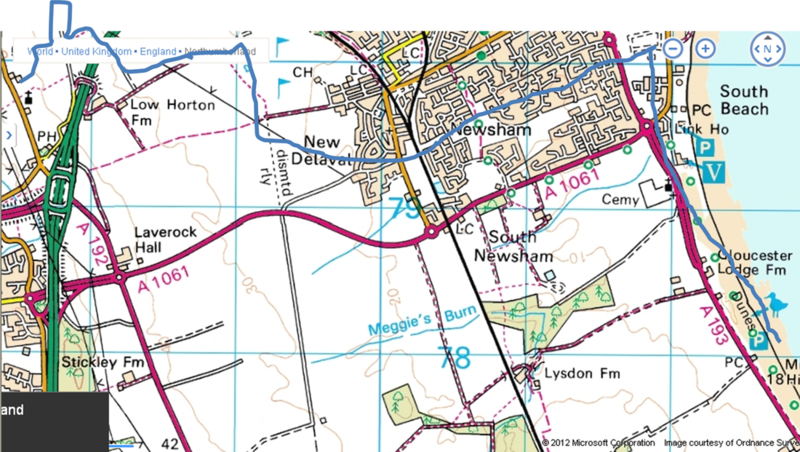 Turn right onto this and follow it for 2 miles into Holywell Dene. You could stop off at the jumps if you want and then continue on your way straight through to the Avenue. Turn left here and head towards Seaton Delaval for a well-deserved ice-cream. Cross over the roundabout and cycle straight down A190 until the mini roundabout and turn right onto Mare Close, straight down that lane, over the railway and follow the track to the next junction. This takes you to Middle Farm at Seghill so follow the track to the round keeping left until you can see the Big Spoon. 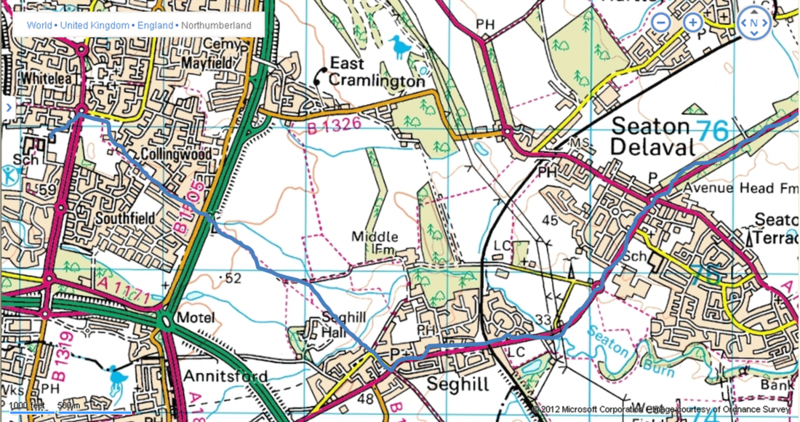 Then it is straight all the way back into Cramlington.